This is Part 4 of our Introduction to Lean Manufacturing Principles Series. You can find the CNCCookbook home page for Lean Manufacturing here. Value stream mapping is a lean-management method for analyzing the current state and designing a future state for the series of events that take a product or service from its beginning through to the customer. At Toyota, it is known as “material and information flow mapping”. It can be applied to nearly anyvalue chain. 1. Identify what target you want to analyze. Perhaps it is the entire manufacturing process for a product. Perhaps it is some Kaizen-derived target that will the the subject of a Kaizen Blitz. 2. While on the Shop Floor, sketch out the current value stream map which shows how things are being done today. This map needs to show all the current steps, delays, and information flows required to complete the product or service. 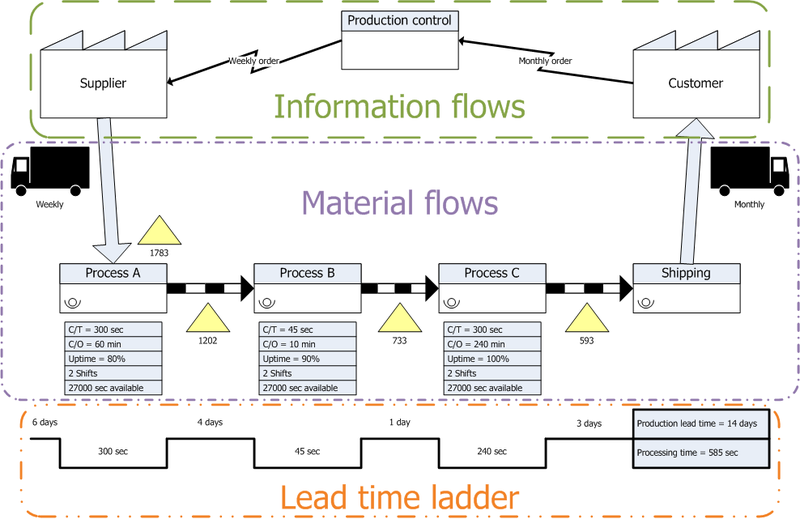 Note that this can be either a production flow depicting raw materials to consumer, a design flow depicting concept to launch, or virtually any other kind of process stream you’re trying to analyze and optimize. There are standard symbols available to help simplify the drawing of the Value Stream Map. 3. Analyze and assess the current state value stream map to decide what the opportunities are to enhance flow by eliminating waste. 4. Draw a future state value stream map that reflects the waste saving changes you’ve envisioned. 5. Get the team working to implement that future state value stream map. In many cases, just the documentation value of having a Value Stream Map that everyone can see and think about will unlock more productivity and make the process more repeatable. – Define the value from the standpoint of the end customer. It is this value that you are trying to maximize. Expending effort to optimize some other value is considered wasted effort. If it doesn’t feel wasted, you need to think about whether it should be added to the definition of customer value. – Create the VSM for the product family. – Make the product flow. – Let the customer pull. – Manage by successive iteration towards perfection. Making the items flow means thinking about them as flowing, hence the Value Stream Map which graphically shows all those flows. 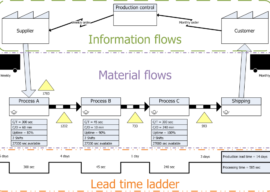 A VSM with truly continuous flow has no need for inventory between process steps. Such streams are rare, so we deal with inventory and with steps that take differing amounts of time. Lean Manufacturing focuses on this in two ways. First, flows should be driven by Pull not by Push. Push is a necessary outcome of having Pulled. Pulling is nothing more than having the downstream (closest to customer) steps signal their need for more upstream process output. We’ll talk more about Pull in future installments. Second, Lean Manufacturing analyzes what it calls Takt Time, which is a study of the meter or rhythm of the flows with the idea of at least understanding their inter-relationships and ultimately making flows more continuous. Again, we’ll talk more about Takt Time in a later installment. – Dedicated Process Icon: A process, operation, machine or department through which material flows. – Data Box Icon: Collects the important data required for analyzing the system. – Inventory: Shows the inventory level between two processes. – Push Arrow: Represents the “pushing” of material from one process to the next. – External Shipment Icon: Represents external transport logistics either from suppliers or to customers. – Information Flow: This one has the jaggie that depicts electronic information flow. A straight arrow reflects manual information flow. There are many more standard Value Stream Mapping symbols that can be found from a variety of sources, such as this University Course or on the Strategos Site. You can also get software to help drawing these diagrams. For example, templates of standard VSM symbols are available for Microsoft’s Visio drawing software. Even if you don’t have special software or templates, you can sketch your VSM and take photos with your camera phone to communicate the results. I’ve done this on a lot of diagrams and drawings developed in meetings and it works great if you don’t mind a graphic that looks hand drawn. 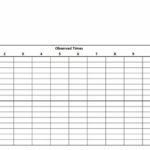 You can even use a spreadsheet for the task. 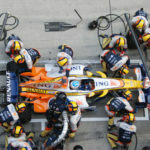 Here’s a great article from iSixSigma.com on using spreadsheets to create Value Stream Maps. By now, you should see how to create a Value Stream Map of whatever process you’re trying to optimize. 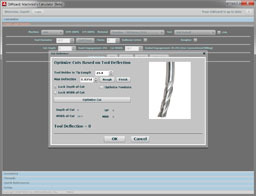 They’re not a requirement, by any means, just another useful tool to help you analyze and improve your Manufacturing processes. As mentioned, you can use software to create them, or you might just use a big whiteboard, at least until everyone is on the same page that you’ve accurately captured the process you’re trying to model. If you’re doing Kaizen, try incorporating some Value Stream Mapping into your Kaizen Events. You’ll be surprised by how much they help. This article has just scratched the surface. There’s more detail and step-by-step walkthroughs available from a variety of sources on the web. The next installment in our Lean Manufacturing Principles Series is about Standard Work and Takt Time. The Standard Work concept is extremely complementary to Kaizen. Be sure to check out Standard Work and Takt Time, Lean Manufacturing Principles Part 5. Lovin’ these Lean articles bob, keep ’em coming!